Since 1979 a series of international symposia on inland saline waters have served to strengthen and expand the scope of limnological research on salt lakes. 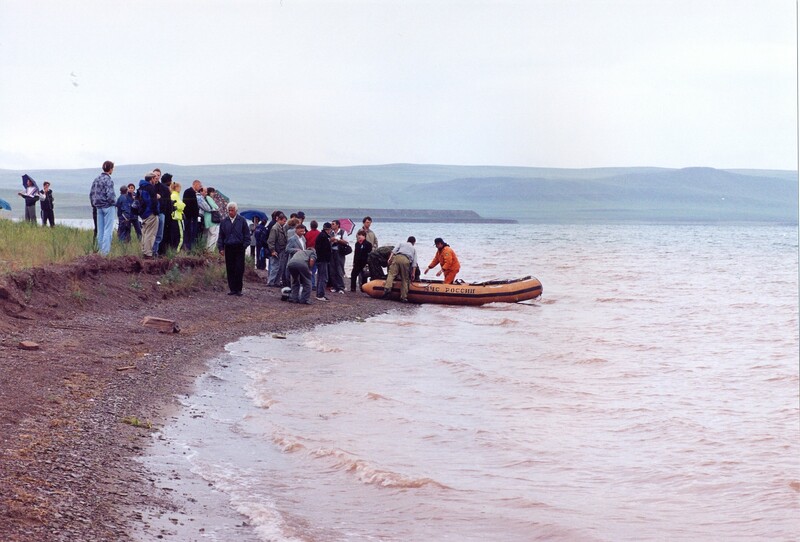 The 8th International Conference on Salt Lakes (July 23-26, 2002) was held at the little spa resort town of Zhemchuzhny on hyposaline Shira Lake and hosted by the Institute of Biophysics of the Siberian Branch of the Russian Academy of Sciences in Krasnoyarsk and the Republic of Khakassia. While the host country was well-represented by 127 Russian Federation scientists, the remoteness of the site and economic factors likely limited foreign participation to 26 scientists from Australia, Belgium, China, Germany, Great Britain, The Netherlands, Ukraine and USA. The study of microbial processes is a very active area of research in saline lakes and was well-represented at the conference. While papers on bacterial processes, geochemistry, lake modelling, and biotechnological and medical purposes dominated, there was a scattering of papers on geology, paleoecology, hydrogeology, climatology, genetics, ecology and biogeography of invertebrates, and lake management. However, fish and bird scientists would have been disappointed and there were few review papers and hence little ‘discussion on grand themes.’ One innovation saw presenters of poster papers being given a few minutes to verbally explain their papers, though too many authors misunderstood the intentions and gave a full oral presentation. The conference was very well-organized by Prof. Andrei G. Degermendzhy, Director of Institute of Biophysics, Siberian Branch of Russian Academy of Sciences and in addition to the scientific program included a tour of several nearby salt lakes, a concert including traditional and modern music (including throat singers), grand opening and closing banquets including many toasts with excellent Russian vodka, and the ever-present, helpful, and amiable troop of translators. In addition to simultaneous translation of presentations from English to Russian and vice versa, translators dined with foreign participants at every meal and thus facilitated our visit. This central southern Siberian republic has several districts of salt lakes including 12 salt lakes with surface area greater than 1 km2 and over 100 smaller ones (>10 ha) of varying chemistry and salinity. The field trip, which unfortunately was dampened by rain, visited several nearby salt lakes with interpretation by local scientists. While the tour was interesting, the uniqueness and differences among lakes within the district are mostly hidden beneath the surface. For a description of these lakes and recent research see the 2002 special issue of Aquatic Ecology, Volume 36(2) dedicated to Lake Shira. Both opening and closing ceremonies and banquets were attended by the press and an array of local and regional officials. There appears to be a sincere interest in understanding and protecting the unique natural and scientific resources represented by these salt lakes. In closing the delegates passed a motion encouraging the local government to support salt lake research and protection. In summary, the conference afforded a valued exchange of information and networking between scientists from remote places. Andrei Degermendzhy and his team are to be congratulated and thanked for their efforts, against many odds, in organising this international conference. Papers presented at this conference were published in a special issue of Hydrobiologia, Volume 576. Abstracts can be downloaded.